Stir fry. Nothing special about it. Noodles. Carrots. Mushrooms. Mini corns. Beans. Crunchy. Not soft. Sizeable chunks. Not minced or squashed. 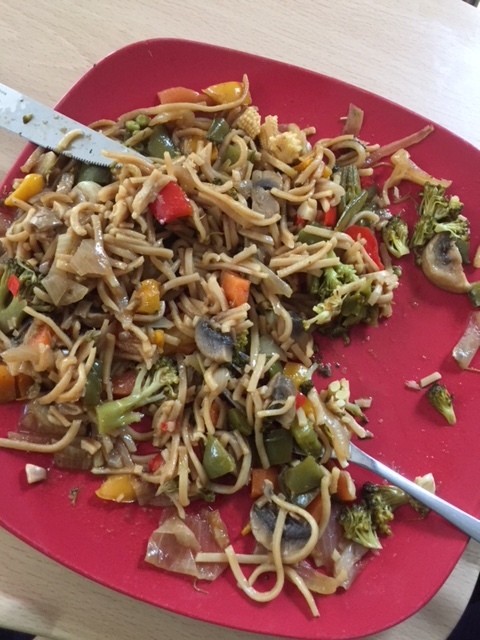 Nothing special about the stir fry (though a big ‘thank you’ to the brilliant cook who prepared it:) — but about Pádraig eating it today. A big plate. With no problems whatsoever. During lunch, we watched self-made documentary. I had searched for “Into the Wild” on Netflix. What it threw up instead was this film called “Expedition Happiness” about a German couple and their dog renovating an old yellow school bus in the USA and driving it through Canada to Alaska and then back down to Mexico. It sounds like everybody’s dream come true. It’s something I’d so much would like to do with Pádraig. In my mind, this would be the ultimate neuro rehabilitation journey. Participation. Integration. Thinking that, instead, we are struggling here every day, waiting for an HSE office that is waiting for another office to give the go ahead who, in turn, are waiting for another HSE office to agree to the go ahead, who, in turn, need permission from another level — sounds almost insane. And I’m not even sure if I have all the levels listed here — all that more than a year after the go ahead was officially announced by the Minister of Health himself as well as the HSE. I had to think about our idea of going to Alaska. Looks like we won’t be doing it this year. One of us here will have to get better first. But we will go. PS: One of Pádraig’s friends called in this afternoon for a few hours. The second day in a row his friends were with Pádraig. It is truly outstanding how they keep in touch and maintain their friendship. Something that is probably more important to Pádraig than anything else. Padraig. Beo and you were there minus parents/carers but just with your friends and others. Well done, The Irish language is important for our wee little Island. It is part of our history, culture, social being. Your Dad sure must be a good cook. The meal looked delicious and I am glad you enjoyed it and the film also. Alaska … so very far away but who knows one day you and your Dad may be taking photos there and sending them back to the rest of us. HSE: I don’t mean to always moan about their lack of performance but we know a young man, now a decade on, with schizophrenia. It took a lot of knocking on doors, emails, approaches to politicians, to try to get some input ie a carer to call to his home to ensure that he had the basics of clothes and hygiene, so we know a little about how non co-operative the bureaucracy monolith can be. I enjoyed the quote. I am now sending you quote which I apply to the HSE by CS Lewis in the 1950’s. We have learnt so very little as yet but people like your Dad on your behalf Padraig and others like me and my partner KT can keep highlighting the need for urgent change so that rehabilitation programmes that are promised are put in place with near immediate effect. My mood is a little low today; a little tired but then we all have down days and up days so I will look forward to your WordPress tomorrow.